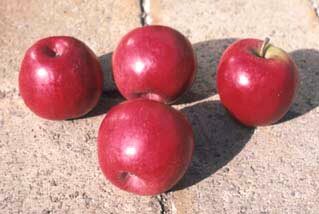 Chance seedling from Donnybrook, Western Australia, about 1935; thought to be a cross between Rokewood and Granny Smith. Moderately susceptible to scab and mildew. Bright pink-red with a stripe over most of the surface. Smooth, firm, crisp texture with acceptable flavour when the satisfactory sugar–acid balance is allowed to develop. Very late, not suitable for cold climates. Precocious bearer, but needs crop regulation for good size. Long; does scald; excellent shelf life.